The 45-member Wind Symphony is under the direction of Erin Sweetsir-Mills. 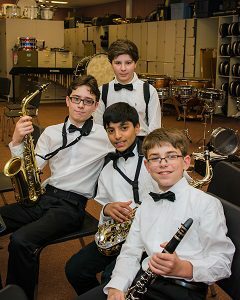 The purpose of the Wind Symphony is to provide an environment for advanced elementary and middle school wind players to improve wind methods as they develop their ensemble skills in a challenging yet supportive environment. Members of the Wind Symphony perform classically oriented arrangements for symphonic band. The Wind Symphony performs in the annual fall concert in November and the spring concert in April.